Alpine’s only “Roadhouse for Wanders”, the hotel breathes a new life into one of the city’s historic structures and offers travelers the opportunity to discover “The Last Frontier” in the Desert Mountains of Far West Texas. Originally built in the late 1930’s by a pioneer ranching family as Grandview Courts, and later operated as the Siesta Country Inn, the recently renovated Maverick Inn seamlessly blends Southwestern and Mexican-inspired architecture with expected conveniences, including daily complimentary continental breakfast and WiFi, and a home-like atmosphere. Located only a few steps away from Sul Ross State University and downtown Alpine. Inspired by the rich and vibrant culture of the area, the hotel offers an enriched experience of the past and future, and embraces you with exceptional hospitality, historic significance, and an experience like no other in the region. 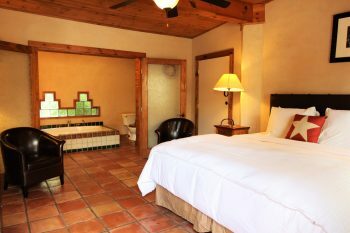 Our 21 guest rooms and suites are beautifully decorated with Southwestern and Mexican allure. Rich colors are complimented by earth-tones which surround you with contemporary West Texas sophistication. Saltillo tile, hardwood, and Talavara surfaces provide the framework for comfortable areas within each guest room. The artwork has been carefully selected to compliment your surroundings. Adorning the walls of our guests rooms are tastefully framed prints by legendary photographer Edward S. Curtis, Mexican tapestries, pottery, furnishings and wears, creating a wonderful sense of the fusion of Americana, Mexican and Native American culture. Our outdoor amenities include a pool area, courtyard, and group friendly horse shoe fire pit. 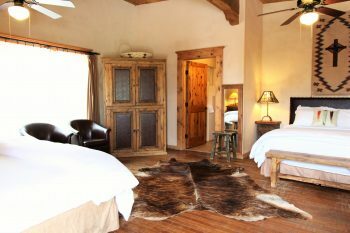 Our ample size standard rooms possess the qualities that define the timeless southwest. Each of these rooms provides our most comfortable square footage, making it perfect for the traveler. These accommodations sacrifice nothing in functionality and comfort, and feature signature down comforters, luxury bath linens and amenities, complimentary in-room coffee service and bottled water, flat panel TV’s, mini-refrigerator, microwave and complimentary Wi-Fi. These quaint rooms offer an inviting queen, king or 2-queen size bed(s) as well as functional work space. The deluxe rooms possess all the amenities of the standard rooms with more square footage for those who wish to stay awhile or just want a little more room to relax. Some rooms also offer a full bath and large walk-in showers. 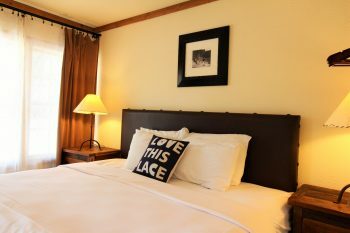 Our deluxe rooms offer 2 queen beds or an inviting king bed. Our superior rooms are located in our most recently renovated historic building. Equally equipped with all the amenities expected in all guest rooms at The Maverick Inn. These rooms feature full size bath or garden tub, fully equipped kitchenettes. These rooms may be rented as suites with adjoining rooms for couples or families.